Tax Credits for 2017 – Extended! Did you purchase a charging station for your electric car in 2017? If so, we have great news for you! Congress recently passed a retroactive tax credit for those who have purchased environmentally responsible transportation, including costs for EV charging infrastructure and electric motorcycles. 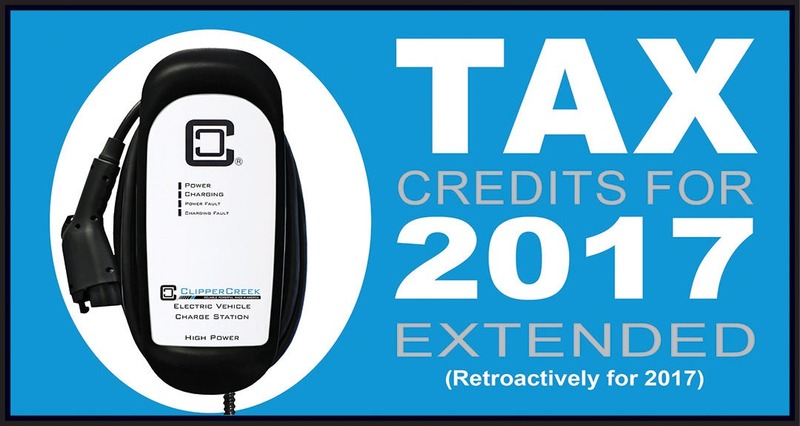 Receive a tax credit of 30% of the cost of purchasing and installing an EV charging station and related installation cost (up to $1,000 per station) with the retroactive tax credit. If you’ve purchased a 2- or 3-wheeled electric vehicle, such as a motorcycle, you can also receive a 10% credit (up to $2,500) for your 2017 purchase. Previously, these tax credits expired on December 31, 2016, but the credits are now retroactively extended through December 31, 2017. Don’t know what you did with your receipt? No worries! If you no longer have your receipt but purchased your charging station from ClipperCreek, send us an email (information@clippercreek.net) or call us at (877) 694-4194 and our team will provide a fresh copy of your invoice. We want you to be able to take advantage of the tax rebate! I can’t find the relevant form for this. I purchased and installed a residential charging stations. Anyone know which form I can use? Hello Kelly! Thank you for your question. The tax form for the Alternative Fuel Tax Credit is IRS Form 8911 and it can be found here: https://www.irs.gov/forms-pubs/form-8911-alternative-fuel-vehicle-refueling-property-credit. Please note that the tax credit was brought back retroactively for 2017 and has not been extended to 2018 at this time.